Now HERE’S the way to get your daily dose of vegetables. 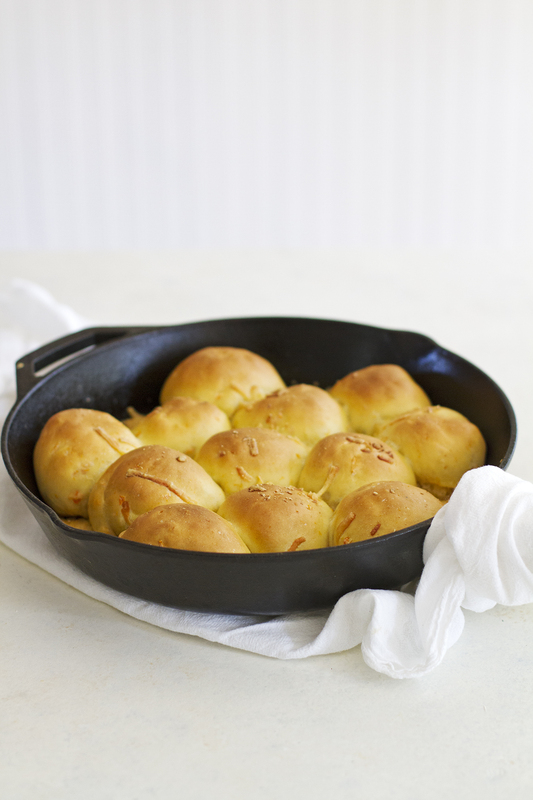 Just stuff them in a soft, cheesy, pull-apart roll. I’ve never really been one to turn up my nose at veggies (except for carrots, which I’m kind of iffy about unless they’re in this form), but that’s not the case for the rest of the humans I live with in this house. The small human has an aversion to all veggies except those that can be dipped in ketchup, and the tall human will only gladly eat vegetables that are on top of a frozen pizza. So I am often alone in being excited about eating salads and such. 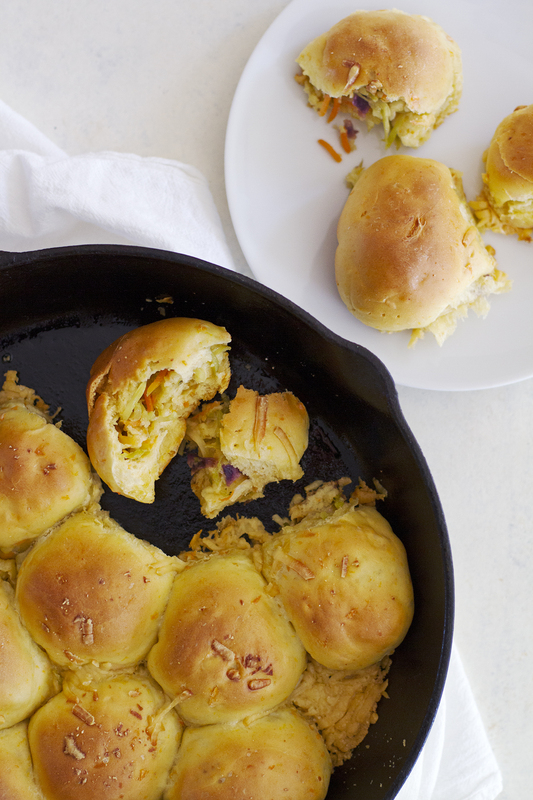 But these stuffed pull-apart sweet potato rolls? They were accepted by all, with much gladness. And this made me so, so happy. You know what else makes me happy? The fact that there is a World Baking Day. It’s tomorrow (May 17), and I’m celebrating in partnership with Mann’s Fresh Vegetables by sharing these veggie-filled rolls with you. 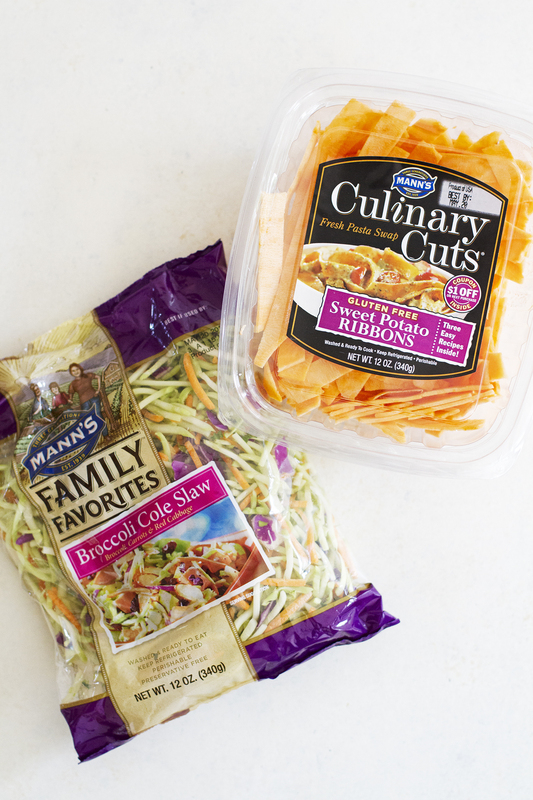 The rolls themselves are baked with Mann’s Culinary Cuts Sweet Potato Ribbons (which also happen to be amazing as “noodles” with pasta sauce or mixed into a salad) and the filling is made with shredded sharp cheddar cheese and Mann’s Broccoli Cole Slaw. And I added an extra handful of shredded cheese to the skillet in which the rolls are baked, just because. It’s the right thing to do on World Baking Day. Each bite of these rolls is half crunchy, half cheesy and the rolls themselves are extra tender and soft/pillowy thanks in part to the sweet potatoes. They’re flavorful and fun and perfect as a side dish to just about anything, from soups to chili to grilled meats. We’ve been eating them as a snack in recent days, too, and I can feel good about it because it’s homemade AND baked with vitamin-rich veg. And since both the toddler and the husband (and I) approve of these pull-apart rolls, there is no doubt we will be enjoying them over and over again, especially when an occasion calls for rolls (which is often, amiright). So, how will you celebrate World Baking Day? I suggest you do so by baking and stuffing your face with these rolls. Just a thought. In small bowl, dissolve yeast in warm milk. Let stand 5 minutes. 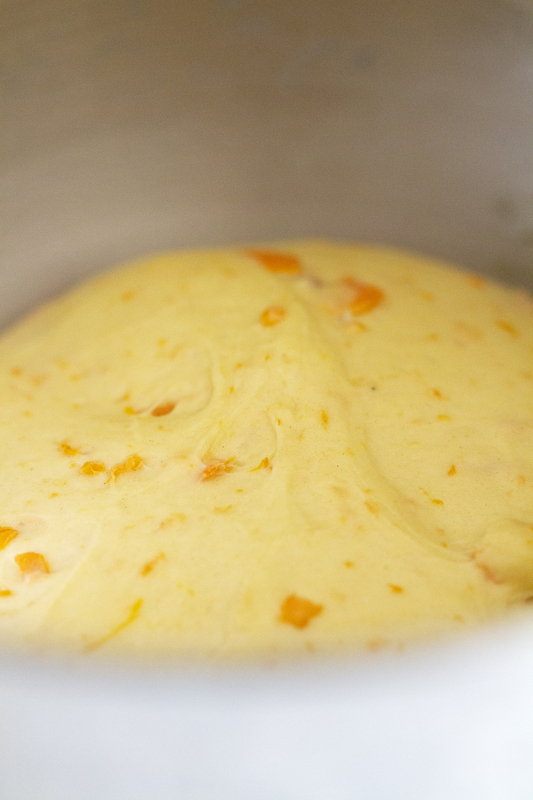 Meanwhile, in medium bowl, combine sweet potato ribbons and 2 tablespoons water. Cover loosely with plastic wrap. Microwave on high 5 minutes until ribbons are just cooked through. Measure out 1/2 cup ribbons and add to large bowl or bowl of stand mixer (reserve leftover ribbons for another use). Add 1 1/2 cups flour, sugar, salt, melted butter and egg yolk. Stir until just combined. Add yeast mixture to flour mixture. Using wooden spoon or dough hook attachment of stand mixer, stir until dough forms. Knead dough by hand on lightly floured surface for 10 minutes, adding just enough of remaining 1/2 cup flour as needed until dough is smooth, soft, elastic and only slightly sticky; OR, in bowl of stand mixer with dough hook, knead dough on medium speed 5 minutes, adding just enough of remaining 1/2 cup flour as needed until dough is smooth, soft, elastic and only slightly sticky. Shape dough into ball; place in large bowl and cover with plastic wrap. Let rise 1 hour in warm place until doubled in size. Meanwhile, in medium bowl, combine broccoli cole slaw and 1 tablespoon water. Cover loosely with plastic wrap. Microwave on high 2 minutes until nearly cooked. 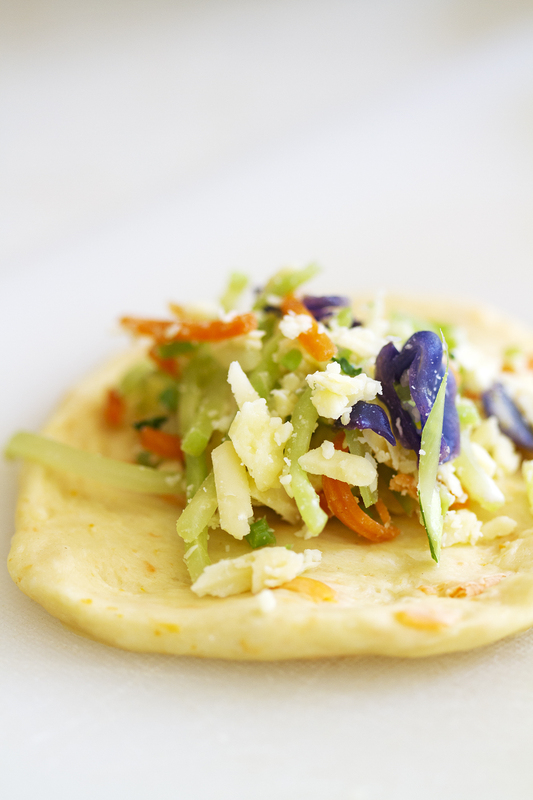 Drain excess water; combine slaw with 3/4 cup shredded cheddar cheese. Brush bottom and sides of 10 to 12-inch cast-iron (or any oven-safe) skillet with olive oil. Punch down risen dough. Divide dough into 12 equal pieces. Roll out each piece into 4-inch flat circle. Top each piece with about 2 tablespoons broccoli-cheese mixture. Fold dough up and over mixture, pinching seam to seal. Shape each dough piece into ball. Place dough balls evenly apart and seam side-down in prepared skillet. Sprinkle remaining 3/4 cup shredded cheese around rolls in skillet. Cover with clean kitchen towel or plastic wrap and let rise 30 minutes. Heat oven to 350 degrees F. Uncover rolls and bake 30 to 35 minutes until golden brown and cheese is melted. Cool 5 minutes in pan before serving. Disclosure: This post is sponsored by Mann’s Fresh Vegetables. All opinions are my own. Yum! Those look really good. Broccoli and cheese should go on everything!! Such an awesome idea, my boys would love these! Matt — Thanks! My daughter gobbles them up! Best way to eat veggies EVAH! 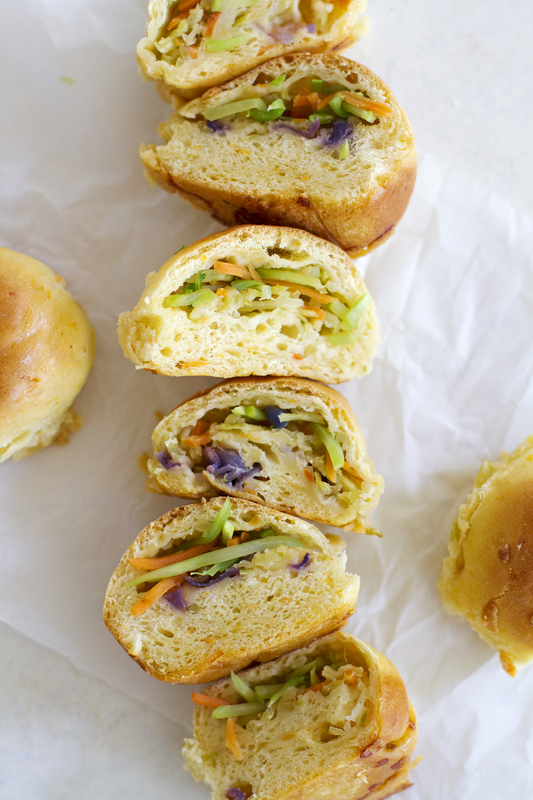 These sweet potato rolls look sooooo fluffy and perfect. I’m sold! What a great way to get those veggies in! This is such a good idea! Yummm what a fun idea!! !